New tyres can be very slippery (especially if ridden in the wet) and need to be 'run in' correctly to help prevent any accidents. The slippery surface on a new tyre is caused by 2 main reasons. ~When new, a tyre has a very smooth surface and in order to obtain maximum grip, the smooth surface needs to be 'scrubbed in'. ~Some manufacturers use 'releasing agents' when they make the tyres. These 'releasing agents' contain 'anti-ageing preservatives' which help to stop a tyre degrading whilst in storage. Releasing agents need to be scrubbed from a new tyres surface. ~A new tyre needs to be seated on the wheel. This is not fully achieved when fitting a tyre and it needs to be ridden on with caution to complete the process. ~In order to achieve optimum performance, the various components of the tyre (belts, tread strip etc) need to be correctly bedded in to one another. If not run in correctly, a tyre may not give the best possible performance. Although rubbing a new tyres surface with an abrasive material (like emery paper) doesn't help the running in process, it can help to remove releasing agents and assist with providing initial grip. The motorbike or scooter should be kept as upright as possible for the first 50 miles, then gradually leaned into the corners. As the mileage increases, the lean angle can be increased. Try to avoid harsh acceleration and braking and keep the power delivery as smooth as possible whilst running in tyres. The table below is of the speed ratings for different tyres (e.g. 150/70-17 M/C 69V). 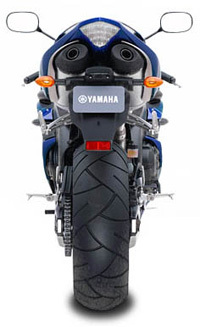 It is not advisable to fit lower or higher rated tyres on a motorcycle or scooter (for example-fitting 'F' or 50mph rated tyres on a Suzuki GSXR1000!). Even if you never travel at the speeds indicated by a tyres speed rating, fitting incorrectly rated tyres will result in sever loss of performance and handling and may result in tyre failure (blow out!). There are 3 main types of motorcycle and scooter tyre construction. Radial tyres~These are generally wider tyres designed to fit on wider rims. Radial tyres have a more supple or flexible carcass which makes them better suited to modern motorcycles. Bias tyres~These are generally narrower tyres designed for bikes produced in the 1980's with more rigid frames. Crossply~Designed for classic motorbikes and scooters and generally fitted with an innertube inside the tyre. Tube type tyres~These tyres require an inner tube to be fitted inside the tyre. Most spoked wheel motorcycles (for example off road and MX motorcycles) use a tube type tyre because without an innertube, the air would seep out of the holes where the spokes go in. The charts below show combinations of tyre types that can and can't be used on a motorcycle. Using the wrong tyre types will mean an MOT failure. Please remember-Just because a mixed construction fitment is legal doesn't necessarily mean that it will be suitable for the motorbike or scooter. For example: A tyre marked MT90-16 is the same as a 130/90-16 tyre. A tyre marked MH90-21 would be the same as an 80/90-21 tyre. Below are the guidelines for checking your motorcycle or scooter tyres to ensure they are safe for road use and to ensure they meet MOT and legal requirements for the UK. Over one quarter of MOT test failures are due to worn tyres and running your motorbike or scooter on badly worn tyres can result in heavy fines and points on your licence! ~Tyres must be suitable (i.e. of the correct specification and size) for the use to which the vehicle is being put and must be inflated to the vehicle or tyre manufacturers' recommended pressures (in other words, don't try and put car tyres on a motorbike!). Most manufacturers recommend changing tyres once the tread depth is down to 2mm as once the tread gets below 2mm, acceleration, braking and handling can be severely affected. ~A cut in excess of 25mm or 10% of the section (width of the tyre) , whichever is the greater, measured in any direction on the outside of the tyre and deep enough to reach the ply or cord would deem the tyre illegal. From 1 June 1997 all new motorbike and scooter tyres must be ECE or EU approved and display an 'E' or 'e' mark. Since 1 January 1995 it has been illegal for any person to supply re-treaded tyres unless they are marked to indicate compliance with the current BS AU 144 standard. It is also illegal for any person to supply a part-worn tyre which does not comply with legal requirements and which does not have tread grooves at least 2mm deep. Up to 'J' speed rating-a maximum of 2 repairs, not exceeding 6mm in diameter. The repairs are restricted to the center of the tread area, not more than 25% of the tyres width either side of the center line and not on the tyres sidewall. Repairs must be made using a 'mushroom' type plug. Motorcycle and scooter tyres slowly lose air pressure through the rubber of the tyre, which is why it is important to regularly check the tyre pressures before riding. Check tyre pressures once a week and always when the tyres are cold. Correct inflation pressures are critical to a motorcycle or scooter's safe handling. Incorrect inflation pressures can lead to tyre damage, poor handling and irregular and rapid wear. If tyre pressures have been adjusted for 'off road use' (e.g. track days or trial riding), they must be returned back to the recommended pressures before being used back on the road. Check your owners manuel for the manufacturers recommended tyre pressures. On many bikes, recommended tyre pressures can also be found on the chain guard. Tyre pressure is the first thing you should check if the bike starts handling badly. Even a couple of pounds difference in the pressure can make a huge difference and rapidly increase a tyres wear. But, the above pressures are very rough guidelines only, you should check your bike's handbook or ask the manufacturer or authorised dealer for the exact tyre pressures! As a tyre rotates, the movement forces and the heat generated cause the tyre to expand (this effect is greater in Bias-ply or Crossply tyres). As a general guideline, always make sure there is at least 4mm of lateral (sideways) clearance and 14mm of radial clearance between the tyre and any part of the motorcycle or scooter, especially the mudguards, forks, swing-arm and hugger. Be especially careful when fitting tyre sizes other than the manufacturers recommended tyre sizes.